AppCoins News Update, or ANU for short, is a regular bi-weekly update by the AppCoins team. As usual, we are going to cover dev updates, market reports, team members and upcoming events. 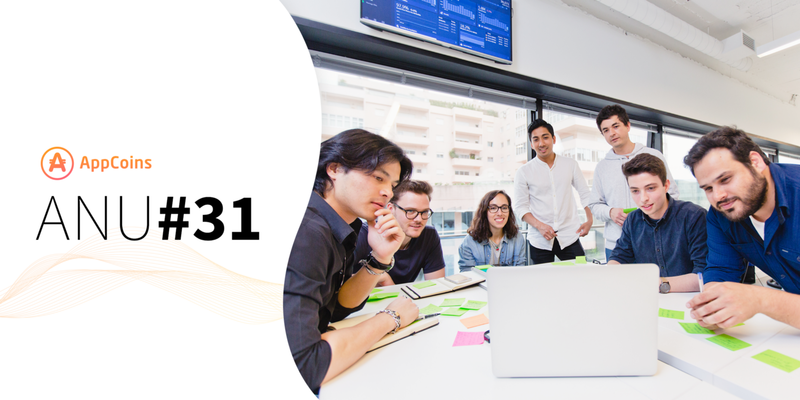 This weeks focus is on APK Migrator Tool improvements, Top Up & Peer-toPeer (P2P) final developments, MWC recap and Game Developers Conference. Since the last ANU, the team’s main focus has been on improving the APK Migrator Tool’s success rate and, also, on the release of the next two major new features — the Top Up and the Peer-to-Peer Transaction. When it comes to the Migrator, we have kept on working on new rules to be applied in the migration process to allow more applications to be automatically equipped with our billing system. Step by step, we are going down the right path to achieve a better success rate of the migration process. In addition, since we are able to include our billing system into the migration — something that already contains a certain degree of complexity — there is no reason why we shouldn’t include another feature that we consider to have great potential not only for developer but also to the users: the User Acquisition features. Our intention is to allow the possibility of integrating the features available on our User Acquisition SDK, as part of the automatic migration. This will make it even easier for developers to integrate the Proof-of-Attention feature as part of a solution to bring more users to their applications. Another important topic that has been previously addressed in other Dev Updates, regards the improvements that have been made in the User Acquisition SDK. The goal is to reduce in size and in dependencies when integrated by the developers. During this week we are publishing the new version of the User Acquisition SDK with version 0.4.7.21b. Our main focus during these last weeks, and for the following ones, are the Top Up and the P2P features. Both of the features are in the final stages of the development, and we are expecting to deliver a new release of the wallet, and also a web portal for the Top Up, very soon. The idea is to allow users to start seeing the AppCoins Credits as a very safe and easy solution to use on purchases. They’ll be able to help friends buy new items on their favorite games by transferring Credits, or to gift a family member with AppCoins Credits so that they can use on an application of their choice. 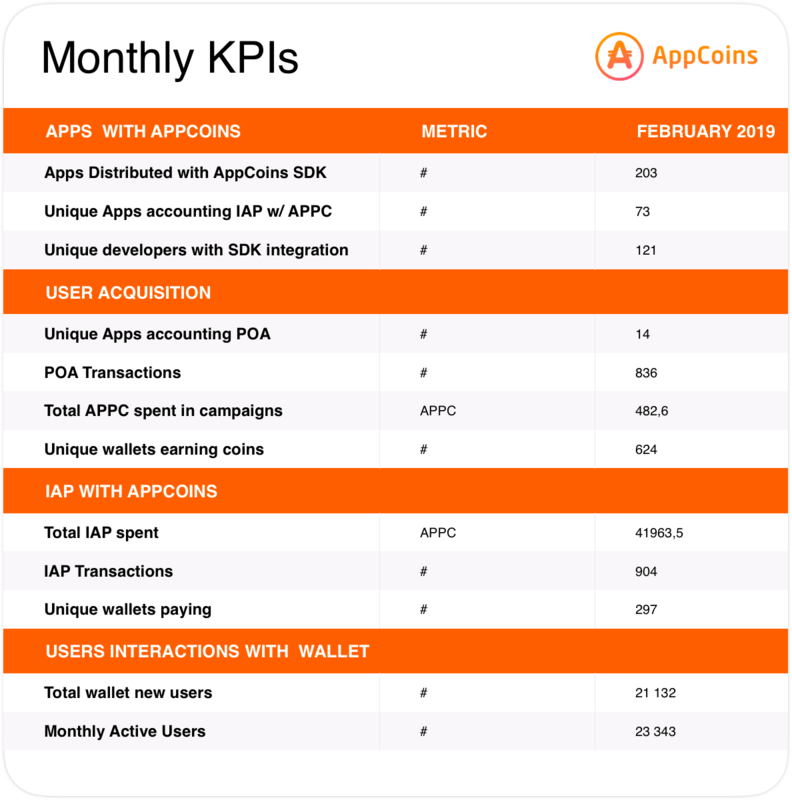 Following last month’s protocol KPIs performance, on this ANU we have collected the values from February, regarding both flows using AppCoins, IAP and User Acquisition, the number of apps downloaded with the integration of AppCoins as well as indicators from the SDK, as the table shows below. At the time of writing, the current market cap is close to $7.53 M USD, with $1.80 M USD in volume in the last 24 hours across these exchanges: Binance (89,58%), Huobi (10,41%), HitBTC (0,01%). Since the last ANU, APPC value has witnessed a high of $0.106 USD on Mar 9th, and a low of $ 0.053 USD on Feb 28th. 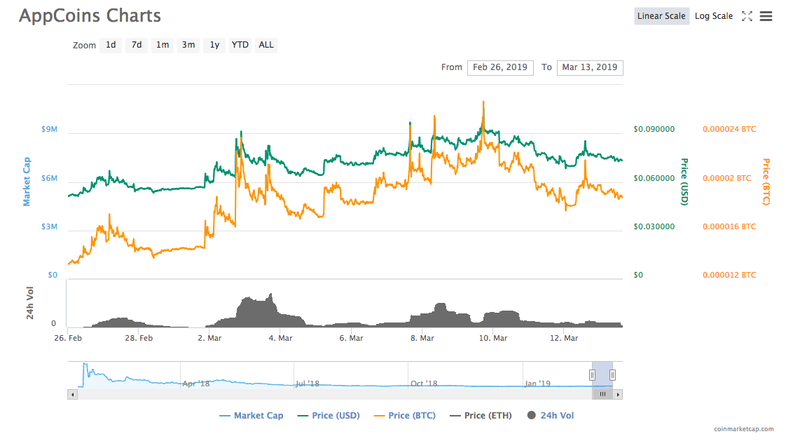 You can see more info about APPC markets at Coinmarketcap. Bio: Jorge came from the advertising universe aiming to speak the same language users do. With a strong focus in motion UI and Animation, he’s working alongside the AppCoins team to deliver an optimal and unique user experience. Mobile World Congress is one of the biggest events in the mobile industry. Every year, it’s visited by over 100K attendees and includes thousands of exhibitors, gathering all sorts of mobile ecosystem players in the same compound. 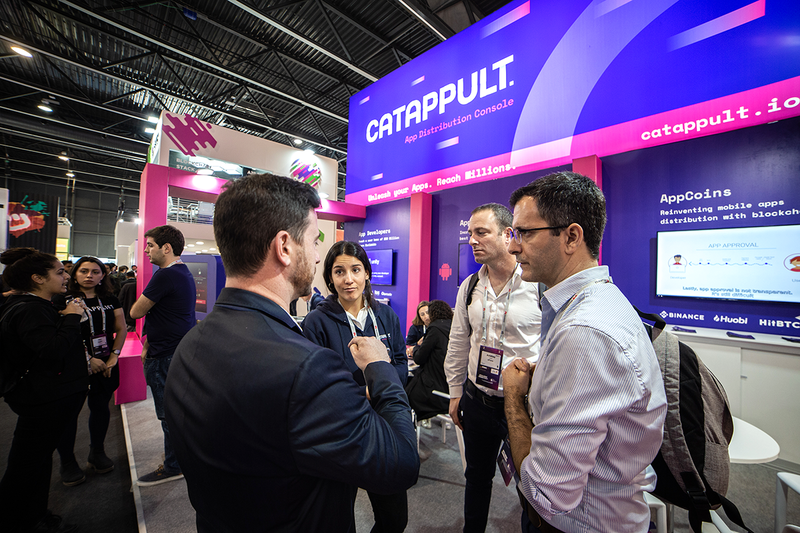 From day 1 Catappult’s booth was packed with curious visitors looking to find out more about the world’s first Blockchain Android multistore app distribution console. Between exciting meetings with Early AppCoins Adopters app stores such as Cherry Mobile and Multilaser, and others that are currently using Aptoide’s API solution like Xiaomi and VIVO, to encounters with developers looking to find out about a new alternative way to distribute and monetize their apps — we are glad to say that Catappult was shown a lot of interest. During the event, developers that have already integrated Catappult and that are now using AppCoins Billing System were able to share their experience in exciting interviews. Alberto Buendia Hernandez, Co-founder at Mobiground, Muhammad Satar, CEO at Infinity Games, and Enric Cabestany, General Manager Europe at IGG -were a few of them. Take a look at the biggest highlights of the event in the video below. The Catappult team will be attending Game Developers Conference (GDC) — the world’s largest professional game industry event. GDC brings together 28,000 attendees to exchange ideas and shape the future of the industry with five days of education, inspiration and networking at the Moscone Convention Center in San Francisco. The team will be at GDC in partnership with Unity to discuss the main opportunities for developers who choose to adopt Catappult’s Billing System — the first blockchain android distribution platform — and the AppCoins Protocol. 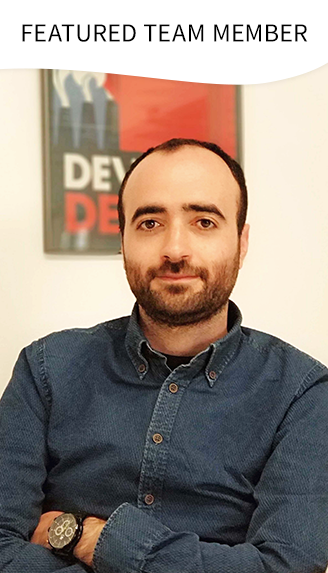 They will also participate in other various events, including The Unity Answer Bar where Nuno Monteiro, our Unity Developer, will be answering questions regarding Catappult, and the popular Unity Speed Dating event where participants and developers have a chance to network. The team will also be placed at the Unity Extended Family Booth during the 21st — first day of GDC. Stop by to learn about the various advantages of partnering with us. We’ll be happy to discuss any inquiries you might have, or you can also book a meeting with the team. The Game Developers Conference will take place in San Francisco, between 18–22 of March.